Thermoelectric devices have been around for a long time. By running electrical current through them, one side gets hot while the other gets cold. Many are used to cool sodas in a cooler, keep a computer’s processor cool and have even been used on spacecraft. When run backwards, by applying heat to them, they can also produce electricity. I would sure love to see a well designed thermoelectric generator, which could produce some electricity from the heat of a candle flame. I would only expect a watt or two of power at most from this system, so the power would level would only be good for charging up a cell phone battery or maybe powering an emergency radio. It could also power one or two high output white light emitting diodes (LEDs) for emergency illumination. The light from those devices would produce far more light than the light from a single candle flame. 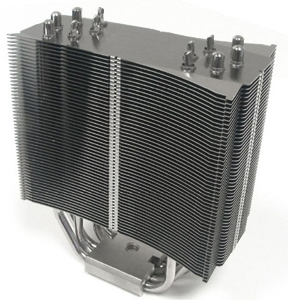 As illustrated, I imagine a thermoelectric device sandwiched between a copper plate and a massive heat sink. 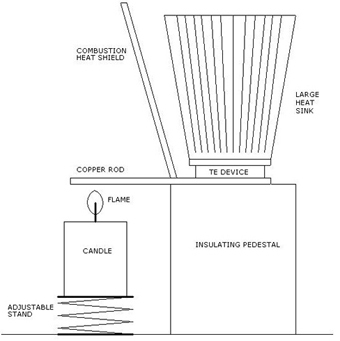 The assembly would be mounted on a ceramic foam insulator, which would act as a pedestal. Heat from the candle flame at one end of the plate would be routed to the bottom of the thermoelectric wafer at the other end. This indirect heating method should increase the efficiency by keeping the heat of combustion away from the heat sink. An insulating shield along the side of the heat sink would add additional protection from excess heat from the candle flame. An adjustable stand would be used to keep the flame just below the copper plate, as the wax was burned. 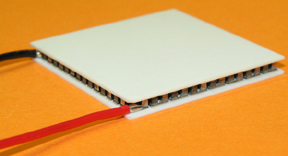 The direct output current from the thermoelectric generator may have to be boosted to a higher more common voltage, using a DC to DC converter circuit. Many cell phone batteries are charged through the phone from a +5v source. Other devices, like MP3 players and some radios may also be powered by +5v. If the device could be kept going for 24 hours, some 50 watt-hours of electrical energy might be produced. This might even be enough to charge up the battery of a small laptop computer.